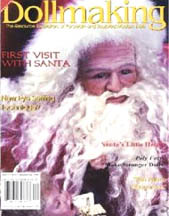 Poindexter is a brown-eyed 22-inch Porcelain Santa who was featured on the cover and center foldout of Dollmaking Magazine (Nov/Dec 1997). 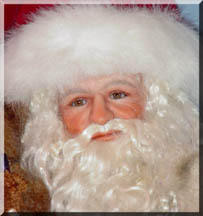 He was painted by Jennell Poindexter, signed and dated 7-1997. 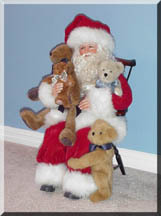 His original "crybaby" doll (included with him in the magazine) has been long-lost (he has been through several owners, including one who turned him into a hillbilly and gave him a haircut). 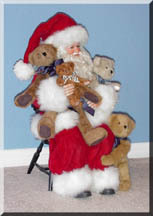 Poindexter has been restored to better-than-original Santa-status, including the addition of lots of gorgeous new mohair, his own Windsor chair, and a number of bears, including one who is attached to his leg. 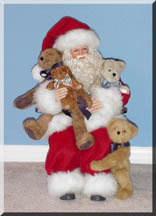 Santa really prefers these bears to the crying baby!